PTC hosts ROBOTalk, a weekly webinar offered by PTC from September through November to all FIRST teams. Renaissance Robotics highly recommends these. Sadly, in 2016, these ROBOTalk's are no longer done. We encourage you to watch the archived ones. 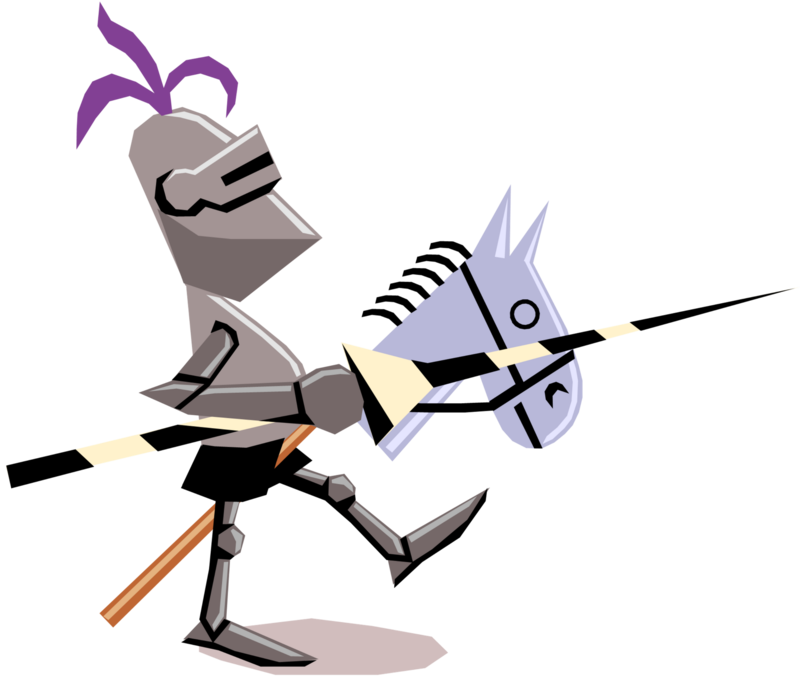 November 18, 2015 - What is the Internet of Things! Team 5937 Renaissance Robotics received a generous grant from PTC (THANK YOU!). The banner to hang in our pit area at tournaments arrived today. This is a quick video we made during its de-boxing. We couldn't have done it without the support of PTC! Renaissance Robotics finished 2nd in the state in the regular season. Winning the Think Award for our Engineering Notebook sent us on our first trip to Texas for the South Super Regional Championship! A year later, we would be heading back to Texas for our second South Super Regional Championship event. The 2015-216 season we made our third trip back to Texas and the South Super Regional Championship. This time on 2nd place Inspire. We also won the Think Award for our Engineering Notebook which would have also got us there. Qualifying for these Championship events would not have been possible without the use of CREO and support of PTC . 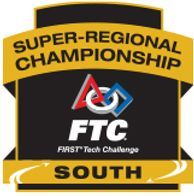 We're hoping the 2016-2017 season sees us back at the South Super Regional Championship with our PTC banner proudly displayed in our pit area once again. A pdf of the homework to do PRIOR to this first webinar will be sent out when you RSVP as well as your log on code. The homework will be the instructions to download and configure PTC Creo correctly. The webinar is to check that your computer is set up correctly and the software downloaded and configured correctly and to walk you through resolving any issues. (We will start with a check and verify you did all of your homework correctly. If you did, you only need to stay on for the first 10 minutes, but please log on early because will only do the check in the first 10 mins and at the very end.) We highly recommend everyone who might use cad attend from your team. Setup and configuration is the one item that takes teams the longest (literally hours) and if not completed BEFORE the actual cad training frustrates the team. 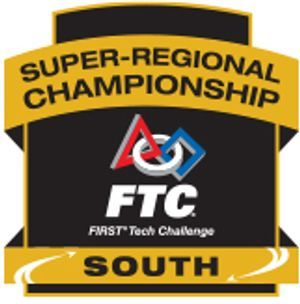 Attending the webinar is free for all FIRST FTC teams. We will use Kahoot! Mobile app as well and teams can win some prizes. So please download the Kahoot! Mobile app on your smart phone. Creo Training Webinar, Sunday, September 23rd from 9am – 11:30am via Adobe Connect. A pdf of the Training Modules will be sent out when you RSVP as well as your log on code. We will step through these modules with a few breaks, so teams can work independently to complete the task before we move on. Having the modules will allow for the more advanced students to complete additional training as we will be pacing the training through the modules for the rookie teams. -Attending the webinar is free for all FIRST FTC teams. We strongly suggest having the students get together –a classroom with their laptops where they can interact with their other team mates makes a great way for teams to bond and learn off of each other. We scheduled the times so that teams could easily eat breakfast together before and/or celebrate afterwards with pizza. Because of band width limitation and time constraints we are limiting one access code per team. We will use Kahoot! Mobile app as well and teams can win some prizes. So please download the Kahoot! Mobile app on your smart phone. In person Creo Training, For those local to Central Florida, we invite you to attend in person at UCF- Barbara Ying Center. Doors open at 8:00 am for the in-person training and last until 12:00 pm. Out of league fee of $25 per team applies if you attend in person (there will be better prizes and accommodations for teams attending in person). But please make sure you RSVP for the in-person "Tesla University - PTC CREO CAD Training" event via the flfirst.org website. You will be sent an event email asking for the the number of students and the number of adults attending so we have enough material, power, and seats on hand. Answering that event email is how you get your teams "admission tickets". This event usually “sells out” with only room for the students to have a seat in the conference hall. 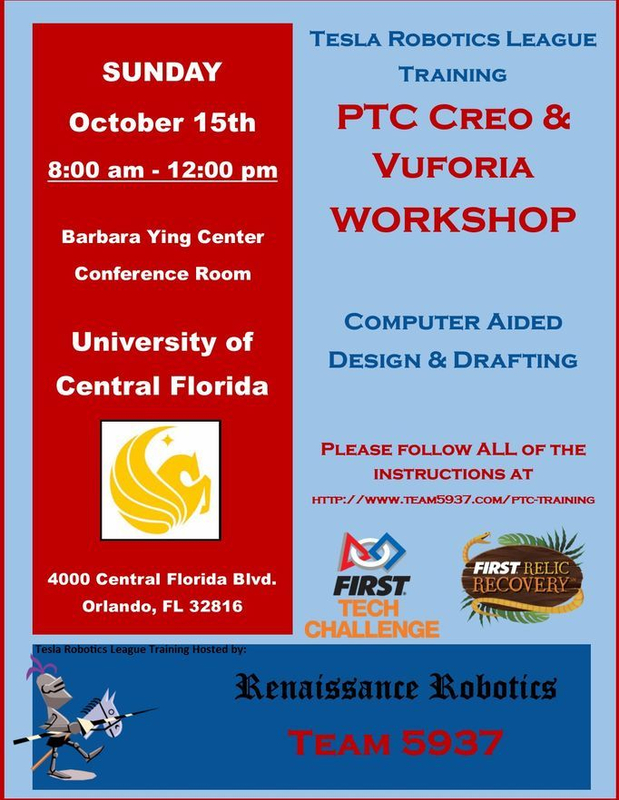 Renaissance Robotics is truly honored to host our forth annual PTC Training Event --- now with VUFORIA! Sunday, September 23, 2018, we'll have several hours of training available. Don’t miss this wonderful opportunity. We have plenty of room with 100 seats available. Due to the nature of this event, there are several steps in the RSVP process. Please be sure to follow ALL of them. 1. Register on FL FIRST. http://ftc.flfirst.org/index.php/season/event-registration ASAP. Remember to print and bring your team roster or waivers with you to check in at this and all FIRST events. NOTE - this is a hands on / interactive class. You WILL be using CREO. It is most effective if ALL your team members in attendance have their own computer vs sharing one with their team mates. Unfortunately, we dont have extra computers available. We suggest asking everyone associated with your team (parents!) if they have one they can lend their kid. We only need the information on members of your team that you would like to attend. You are NOT registered until ALL parts of the registration process have been completed. You will receive a confirmation email within 36 hours. As you can imagine this a great opportunity for training. We expect seats to fill up quickly. Software for FIRST teams is provided by PTC. All attendees will need to download PTC Creo and configure it for the schools configuration (directions are included once an attendee registers for the software). Download PTC Creo - - https://www.ptc.com/en/academic-program/products/free-software/creo-download This can take awhile, so please do not delay. 4. Download the Step Files for the build system your team uses. You may also find the models for this years field & the Matrix kit of parts on that same page, if your team needs them. Please double check that you have done ALL parts of the 5 step process above BEFORE arriving at the Tesla's University training to have your install verified. Remember to bring your laptop with FULLY CHARGED BATTERY to that event. Coaches, please make sure YOU have verified that all of your teams computers have all the necessary items installed. Installation can take a couple of hours, we can not hold up the training day for others if your install is not correct. Remember to get the most out of the workshop, you should have CREO, the FTC kit of parts, Tetrix or Actobotics Step files and the How to Model Anything parts installed. This process can take a few hours so please plan accordingly and take the time to check that CREO is working properly on your laptops. You won’t have time to do this at the workshop on Sunday. As soon as you arrive at the workshop, please boot up your laptop and open CREO; class will begin promptly! If you need assistance, please let me know as early as possible. Room: Barbara Ying Center Conference Room. Click here for map or look for the map kiosks. Room: Barbara Ying Conference Center. Click here for map or look for the map kiosks. Early Saturday morning, September 27th, 2014, before most of us normally wake up, Eighty-Eight (88) eager high school and middle school students from 14 local robotics teams met together for hands on training on CAD modeling and design at the University of Central Florida. Special thanks to East Central Branch of the FL Section of ASCE, East Central SEI Chapter of Florida ASCE Section, PTC, Renaissance Robotics, and University of Central Florida SEI Graduate Student Chapter for joining forces and hosting the first annual “Tesla University”. 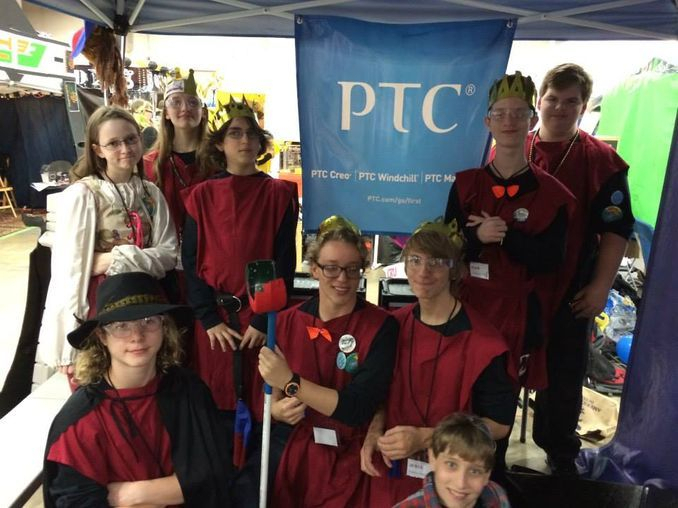 PTC graciously flew down two of their top experts to train high school students and engineering mentors on using PTC Creo and leveraging its amazing capabilities in their FTC robotics activities. For many of these young minds, this was the first introduction to this powerful visualization and modeling tool. The room was filled with laptops and teams of students and mentors learning “How to Model Almost Anything”, which is an in-depth introduction to PTC Creo 2.0 software. The training session guides the users through the fundamentals of solid modeling and provides an excellent overview on navigating and using this powerful software that is typically introduced to college-level students. These young students downloaded the PTC software and the FTC Kit of Parts on to their laptops and were ready to jump in and start modeling. They learned the basics of modeling robots, visualization perspectives, and 3d rotation. The hours flew by and the audience couldn’t believe that they were able to model a car and make the wheels rotate, all before lunch. Lots of laughter and learning went into this great event. ASCE and SEI have supported FIRST teams for many years. We are currently supporting three very talented and motivated FTC teams. The mission of the FIRST program is "to inspire young people to be science and technology leaders, by engaging them in exciting mentor-based programs that build science, engineering, and technology skills, that inspire innovation, and that foster well-rounded life capabilities including self-confidence, communication, and leadership." All three ASCE/SEI FTC teams: Godly Gears, Renaissance Robotics and Super 7, participated in this PTC training event. Godly Gears is a rookie team this year. Last year, Super 7 and Renaissance Robotics were ranked 1st and 2nd respectively in the State of Florida going into the State Championship. These two teams received a bid and competed in the following “by invitation only tournaments” as a result of their hard work and inspired performances in league play: Tesla Robotics League Championship, State of Florida Championship, and the Southeastern Super Regionals in San Antonio, Texas. They have set high goals for the 2014-2015 season and they are working hard to learn, have fun and share their experiences in our communities. These young students are grateful for the support received by ASCE, PTC, and SEI organizations. They represent our organizations in a very positive manner at various community and professional events. We weren't sure what to expect when we applied for the grant. As a second year team, we are still learning and weren't certain we'd be considered. We were beyond ecstatic when we heard we received the much needed grant thanks to the generosity of PTC. 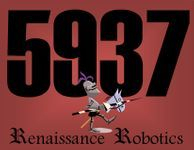 Renaissance Robotics has learned a lot with PTC Creo, MathCAD and Windchill programs this season. With the use of PTC Creo's products, we have greatly improved our robots design and our team's Engineering Notebook. We actually won all the awards in our league and at the state championship this year for our Engineering Notebook. That gave us 4 THINK Awards for this year, to add to our 1 from last year. Having won the THINK Award at the State Championship, we advanced to the South Super Regional Championship with our PTC banner in tow!